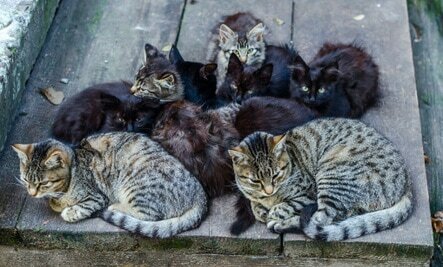 You can improve the lives of outdoor cats with Trap-Neuter-Release, the humane and effective approach for feral cats. To successfully trap, neuter, vaccinate, eartip and release feral cats, you need a plan. Helpful guidelines for humane trapping from Alley Cat Allies, the organization that helped introduce TNR to the United States, will get you on your way! 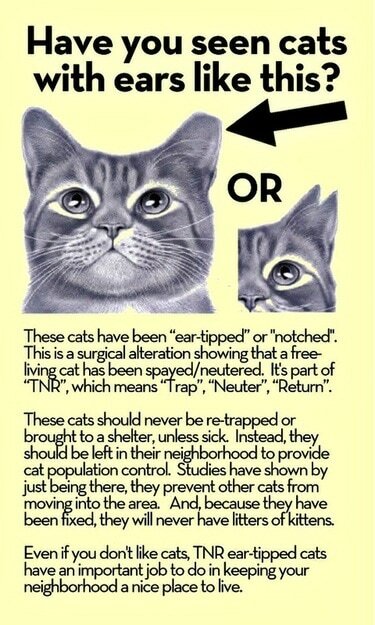 ​Click the link below for more info on Trap-Neuter-Release. Just follow these steps to help make your Trap-Neuter-Vaccinate-Release efforts successful. If you have borrowed your trap from FCF you are responsible for the traps. CatsFirst is a spay clinic for feral, stray and community cats. ​Please give them a call at the number above for more information! ​Do you actually know why cats scratch to begin with? Scratching is normal behavior for a cat. It’s not done to destroy your furniture or that pretty new sweater you splurged on. 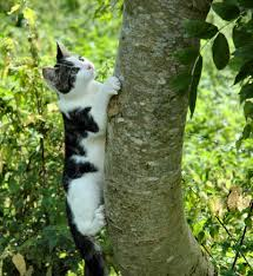 Cats scratch to remove the dead husks from their claws, mark territory and stretch their muscles. Most kittens start scratching at about 8 weeks. of age, perfect time to start training them to use a scratching post. You can entice them to do this with cat nip, treats and/or toys. The Humane Society of The United States does not recommend having your cat declawed except in rare medical cases such as the removal of cancerous nail bed tumors. People have their cats declawed for a variety of reasons, such as protecting their furniture from damage or being scratched themselves . Some people with immuno-deficiencies believe there is less chance of getting an infection from their cat by having this procedure done. Actually, infectious disease specialists don’t recommend declawing your cat as the risks of infection from a cat scratch is less than those from bites, cat litter, or fleas that your cat may carry. Do you have any idea how the procedure of declawing your cat is done? It’s not the equivalent of a human getting a mani/pedicure that’s for sure. Declawing traditionally involves the amputation of the last bone of each toe. If this was performed on a human being, it would be like cutting off each finger at the last knuckle. The negative medical effects of this being done can be pain in the paw, infection, tissue death, lameness, and/or back pain. It can possibly cause your cat to be less likely to use their littler box. What happens if an indoor, declawed cat gets outdoors? How will it be able to defend itself from dangers and predators without claws? 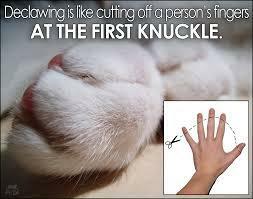 We realize that most cat owners typically do not have their cats declawed to harm them and they probably think they are doing what’s best for their entire family, including their cat, but they should really consider all the facts before having this done to their loving pet. When making any medical or grooming decisions for your pet, do your research FIRST and be an INFORMED pet owner! Visit The Cat Site for more fantastic info about our feline friends!